Coldplay’s currently on tour in support of its A Head Full Of Dreams record, which included a stop at New York’s MetLife Stadium on Sunday night. 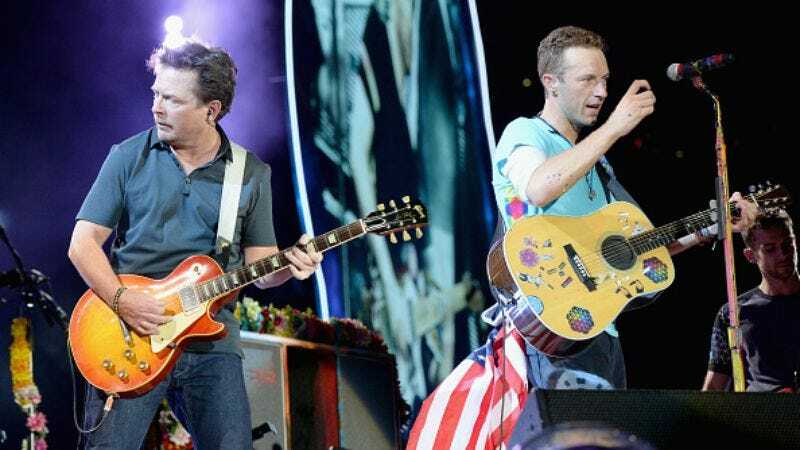 Chris Martin couldn’t arrange for a surprise Beyoncé appearance, despite her contribution to the album, but he did get some help playing The Penguins’ “Earth Angel” and Chuck Berry’s “Johnny Be Goode” from a special guest. Although Fox has said there’s nothing anyone could say (or pay) to get him to reprise his role as Marty McFly—at least, not in the driver’s seat of a DeLorean—he looks like he’s having a blast playing with the band. Then again, he was performing under considerably less pressure than before, when he was racing the clock against the erasure of his—that is, Marty’s—own existence at the Enchantment Under The Sea dance.